The main interior of the unrealised Vidovdan temple. Ivan Meštrović. 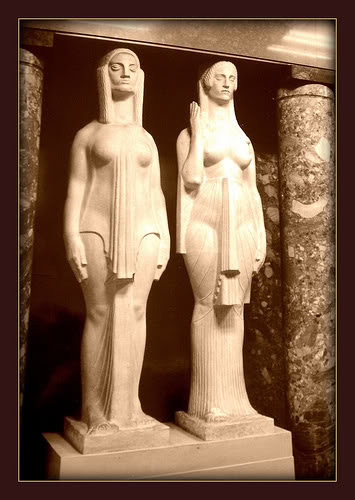 Caryatids. A fragment design from Vidovdan temple-to-be. A mock-up of Vidovdan temple. One can seldom find a Serbian book or epic song that fails to mention Vidovdan or Kosovo. For Serbs, Kosovo is not the place where the Serbian state was destroyed eaten by internal disorders, quarrels, and treasons. It is not one of the darkest pages of Serbian history in which the two sons-in-law of tsar Lazar – Miloš Obilić and Vuk Branković, allured by their desire to get the tsar's crown behaved in a way that should make each Serb blush with shame. But no, for Serbs Kosovo is a sacred relic, the only historic event that makes them proud before the world. Moreover, while the treason of the second Lazar's son-in-law was still unknown and amongst the leaders was spread the rumour about the relations with Sultan Murad of the elder son-in-law, Miloš Obilić, whom Lazar exposed as a liar in the eve of Vidovdan as Judas was exposed; instead, this second Judas in Serb memory was elevated to the height of a legendary folk hero only because his guilty conscience led him the very same night to the Sultan's tent where he made the great feat of basely killing Murad with the knife hidden under his clothes on the pretext to tell him something secret. It's everywhere and always this classical Kosovo for whose historical memory a magnificent monumenal temple (Vidovdan temple) was designed, some of whose details are reproduced here. 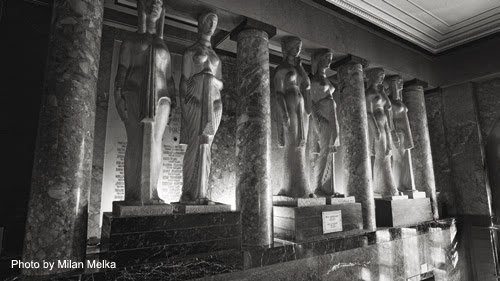 In 1905-1906 Ivan Meštrović in Vienna made his first sketches for the Kosovo cycle consisting of hundreds of sculptures, telamones, caryatids, sphinxes, of the heroes and widows that were intended for representation at the Vidovdan Temple, which was to be the imposing crown of the cycle. He completed most of these sculptures in Paris and for the first time showed them at the 1910 Vienna Secession Exhibition. The ages should know and remember the greatness of the classical Serbian Kosovo. Just look at the fragments of this never-to-be-built temple-monument: caryatids, sphinxes, obelisks, bas-reliefs, which remind the ancient magnificence of Assiria, Babylon, Egypt, and Athens. 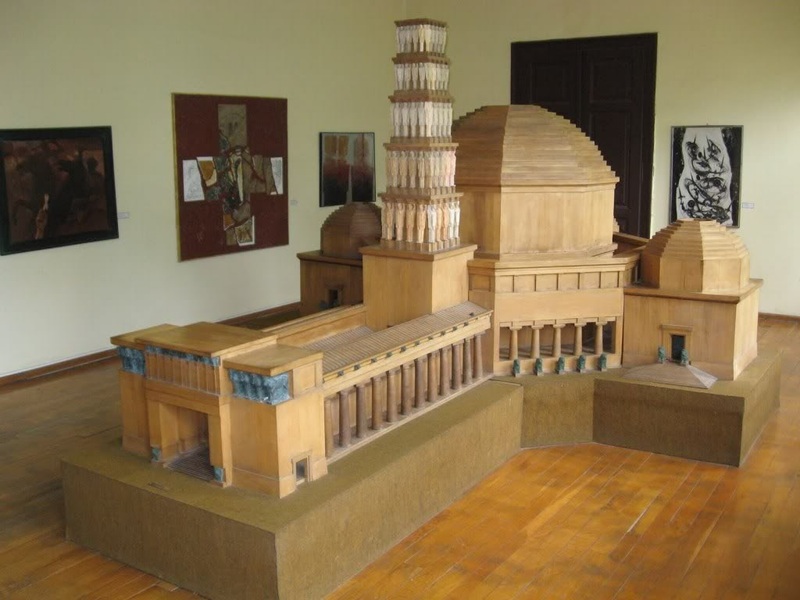 A wooden scale model of the Temple was shown in Rome in 1911 on an exhibition to mark the 50th anniversary of unification of Italy. The actual Temple was to have been 250 meters long with a 10- meter tall bell-tower. Inspired by Kosovo legends, Meštrović’s idea was to place the sculptures of lions at the temple entrance along the staircase and the sculptures of falcons on the portal. Two rows of caryatids placed along the corridor represented the mothers, sisters, wives and fiancées of the Kosovo heroes such as Miloš Obilić, who with his mighty swing, appears as capable of slashing through anything standing in his way, and Srdja Zlopogledja, whose head symbolizes suffering and desire for revenge. 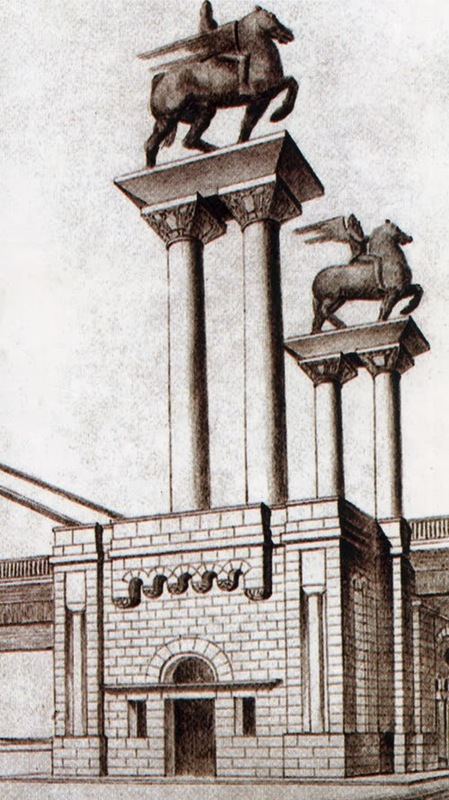 Meštrović's wooden scale model of the Temple had a monumental entrance - resembling a triumphal arch - that led to a peristyle and then to the domed-central structure section encircled by a periptero and a bell-tower next to it with columns depicting the Kosovo heroes. Sounds as an irony – a triumphal arch on a temple commemorating a disgraceful defeat! But this monstrosity was not destined to be built. In the period before WWI, Serbia took the idea of carrying out the Vidovdan Temple building project seriously. 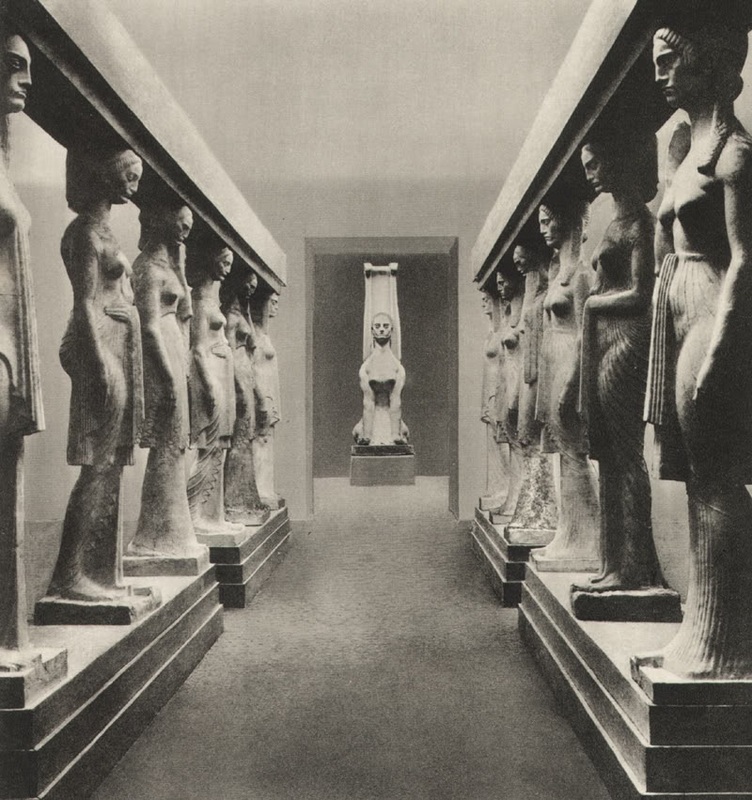 To these ends, a State Committee for the Serbian and Yugoslav Art was set up and its program of activities included the construction of the Temple at Gazimestan. However, with the arrival of WWI all activities ground to a stop. When the war ended and a new state was established, the circumstances within the country had changed and the funds needed for the construction of the Temple appeared not to be the only obstacle. Meštrović himself changed his mind about his ethnic affiliation. After the creation of Yugoslavia, he turned rather to Zagreb and Split than to Belgrade. Meštrović was aware that the construction of the Temple under his precepts would take a long time – generations even – and that it called for a tremendous endeavor to see through. According to some post-WWII assessments, the construction of the Vidovdan Temple would have cost over 300 million dollars. By the way, this is not and cannot be a historical price of Kosovo, nor an expression of the original culture of Serbia; these are foreign motifs of temple elements over which Serbian sculptors toiled because they were ordered from them. Rather, these are symbols of an insane state idea . Let's briefly outline here what is Kosovo in reality and what is its true historical value. In popular interpretation it was defeat at the Battle of Kosovo which brought about the disintegration of the medieval Serbian empire. Careful analysis of the post-Dušan era, however, demonstrates that the empire, this historical accident , had already collapsed long before the battle. During the years of Tsar Uroš's reign (1355-71) the authority which the Nemanjić dynasty represented was completely undermined by powerful lords who succeeded in governing their territories quite independently of their tsar. 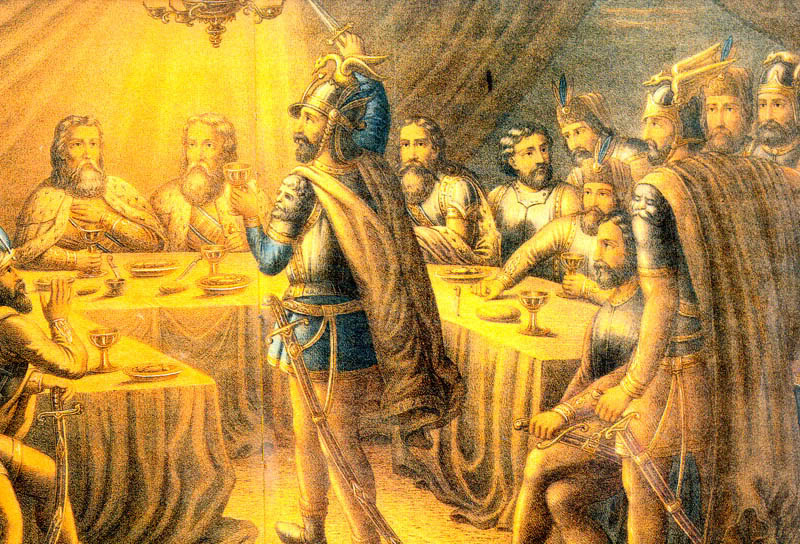 With Uroš's death in 1371 the Nemanjić dynasty became extinct; and in the eighteen years which separate his death and the Battle of Kosovo the struggle for territorial aggrandizement among the nobility of Serbia only continued. We'll use a Serbian source: Historical Pictures by Stanoj Bošković  which, though written as fiction and permeated with patriotic feeling, lacks the chauvinism of later Serbian writers and historians (Bošković died in 1864). 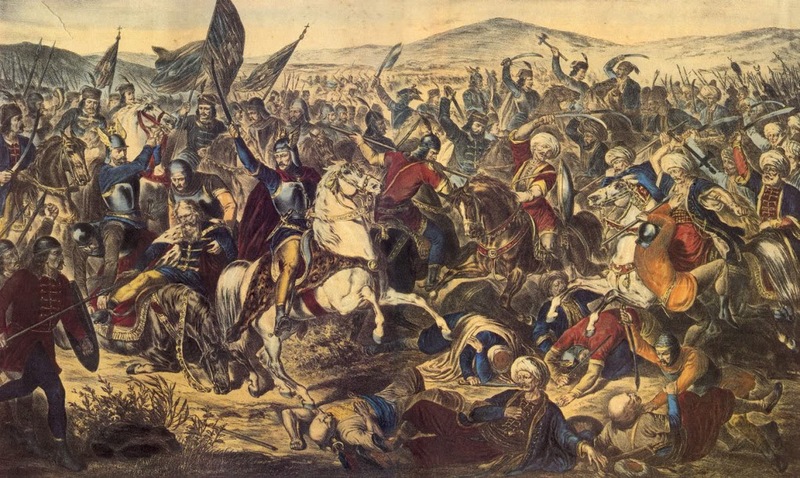 In the eve of the historical Vidovdan at Kosovo, two enemy armies were already stalking each other – the Turks led by Sultan Murad took positions behind Priština, near the river Sitnica while the Serbs led by Tsar Lazar took positions on the other shore of Sitnica and along the river Gračanica. In this last and unequal battle had to be decided not only the fate of Serbia but that of the whole Balkan Peninsula. Could Serbs fulfill this great historical task as representatives of all Southern Slavs, given their unstable state in order to dream about supremacy on the Balkans? Well, this was their only historical opportunity. Tsar Lazar had fully prepared his people to fight , p. 76. In addition, his army included other nationalities: Croats, Bulgarians (Branichevtsi), Slovenes, Montenegrins, Bošniaks led by King Tvrdko, and Romanians led by Mirčo voevoda, all of them eager to take a decisive stand against the new invaders of the Balkans. Sultan Murad, although with a more numerous army, was worried about the outcome of the forthcoming battle; that's why he wanted to take advantage of the proposed treason by the closest relatives of Tsar Lazar, and, as we'll see below, he knew in detail the position and strength of his enemies. In the fateful night Tsar Lazar called together the last boyar council in his tent. Tsar Lazar was deeply worried. The news about the hideous treason committed by his elder son-in-law Miloš Obilić reached him, despaired him, and at the same time embittered him. His state did not have so many lands as Murad took from the former Dušan Kingdom. Very small regions were left under his rule: Mačva, Srem, part of Slavonia, Braničevo, Resava, Nišava, Raška, and Primoria while at the same time Murad had conquered the whole Macedonia, part of Thrace, the whole Thessaly, Epirus, Aetolia, Acarnania, and Albania. Meanwhile, Bulgaria which lived in peace and love with Serbia , p. 82 and which was the foremost Serbian ally had to fall without receiving the promised help , p. 112. 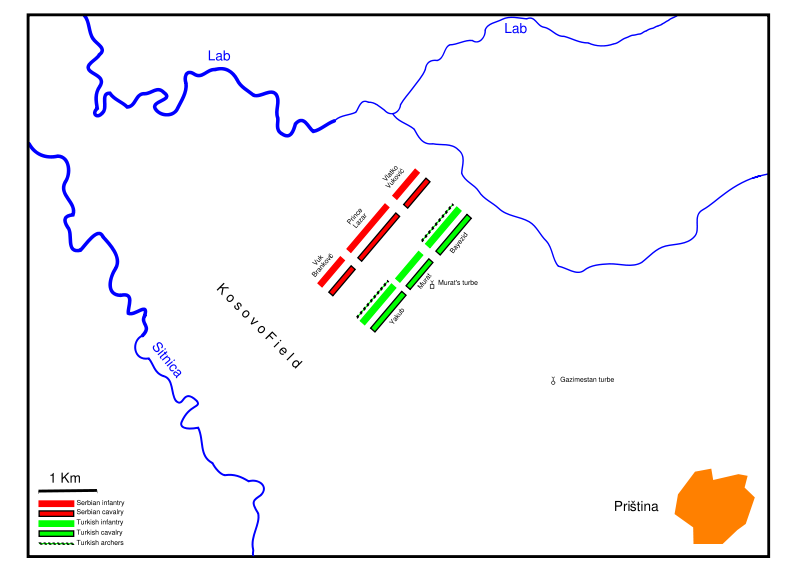 Tărnovo and the glorious fortresses Ovech (Lovech), Nikopol and Dorostol fell into Turkish hands. Lazar sat in deep reverie. Next to him was the old voevoda Jug-Bogdan with his nine sons Jugovići who took both wings of the tsar's table. Around Lazar sat the five voevodas and in their midst was the elder tsar's son-in-law Miloš Obilić. Next to the left tsar's knee sat ban Strahil, next to him voevoda Musić and the two closest friends of Miloš, Milan Topoličanin and Ivan from Kosajnica. Next to the right Lazar's knee sat his favourite, the youger tsar's son-in-law Vuk Branković. The Serb historian doesn't mention (perhaps because it is obscured by time) another circumstance: the soul of the elder son-in-law Miloš Obilić was possessed by the same hellish plot as that of the younger son-in-law Vuk Branković. The first, as eldest, had more right on the throne; however, everything shows that the tsar's favourite was Vuk to whom the command of the right flank of the Serb army was entrusted. Envy and antagonism secretely enticed both of them to an equal degree to commit treason so that each one make friends with Sultan Murad and take the Serbian throne after the Turk victory. Debates and arguments erupt: how to attack the enemy. The tsar takes his cup and drinks to the health of his betrayor: the son-in-law Miloš Obilić. The latter is unmasked by this, he stands up and disappears in the dark night. Miloš Obilić, exposed as traitor, swears to kill Murat. But the Serbs don't see in the person of Miloš Obilić the guilty conscience of Judas who goes to hang himself after the betrayal committed by him; on the contrary, in his decision to go to his sure death in the Turkish camp and the Sultan tent to which he knew the password and the path even in the darkest night – in this Serbs see even today their selfless hero who sacrificed himself for the fatherland. A traitor depicted as a hero. Early at dawn on Vidovdan sultan Murad was stabbed in the belly by Obilić whom he awited with trust and without any safeguard. At first, this causes a terrible confusion in the Turkish camp. Serbs, of course, knew nothing about the decision of their national hero in order to take immediate advantage from this act which would be decisive about the outcome of the battle. Gradually, Turks pulled together; the leadership was taken by Haydar Pasha and the elder sultan's son Bayazid who lifted the spirit of the soldiers with the slogan of revenge. The exasperated Turks rushed against the Serbs. Success changed sides. Tsar Lazar's soldiers fougth bravely but Turks were no less persistent. At one point, Turks pressed to cross Gračanica in order to step on the Kosovo belt that was occupied by the Serbs; they strived towards the Serb center. At the Turkish center stood the leader of archers Haydar Pasha and the two sultan sons took the two flanks. The left flank of the younger son Yakub began to ford the river. Turks, who knew the Serb positions and their command beforehand, expected so much from Serb betrayal as they expected from their own strength. So, against the right Serb flank, the young Murad son Yakub himself fought with the left Turk flank. Vuk Branković, of course, was ready for betrayal, because he, too, was allured by the tsar's crown. King Tvrdko intended to hit Bayazid with the left Serb flank in order to move the fight to the Turkish camp beyond Sitnica. But Bayazid suddenly avoided the attack. He slipped away and rushed to the rescue of his brother Yakub who was pressured by the Jugovići. The whole battle should have occured at the right Serb flank to push back the already tired Yakub. But Jug and Jugovići are left alone and the poor Vuk not only deserted them in the most opportune moment but betrayed his tsar and his people. He retreated with his soldiers on the Goleš Mountain in the most favourable moment when he could have helped his people and finish this great battle on the two shores of Sitnica. This act of Vuk was a death blow on the Serbs. The deserted Jugovići were defeated and Yakub won the victory on the right flank. 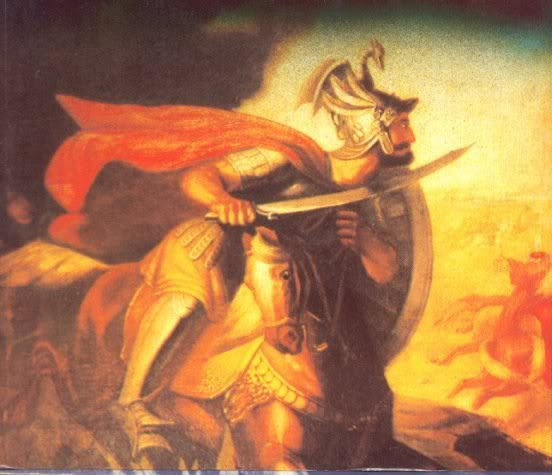 He succeeded to unite with his brother Bayazid and help him against Lazar just as Bayazid helped him at the start against Jug and Vuk. And once the word spread among the troops that Vuk betrayed the noble tsar and that Yakub had won the first victory, it was enough to demoralise all Serbs. Lazar was encircled by both Tukish flanks. And when Tvrdko set off for the Turk centre, the black rumour about Vuk killed the spirit of his fighters and he retreated with the hesitant Bošnyaks. Meanwhile Lazar himself retreated. His warriors couldn't stop the retreating Serbs coming from all sides. A big tumult and disorder reigned among Serbs. Turks stealed among the companies of Lazar, killed the horse under him and the tsar disappeared from view. Thinking that their leader was dead, Serbs were confused even more. Eventually, Lazar reappears, but now it is too late to repair the damage. The confusion continued. Noble bodies fall around the last tsar. So, what else have to glorify Serbs at Kosovo but their helplessness, disgrace, and treason !? Every other people would be ashamed to recognise as hero one who acts his heroism in such way. But Serbs are original on this occasion. This, despite the fact that no one doubts the betrayal of Miloš Obilić which was known to tsar Lazar and most of his noblemen. 1. Станоj Бошковић. 1882. Слике из српске историjе, Београд. 2. Флоринский, Тимотей. 1888. Памятники и законодательной деятелности Душана, Кiев.